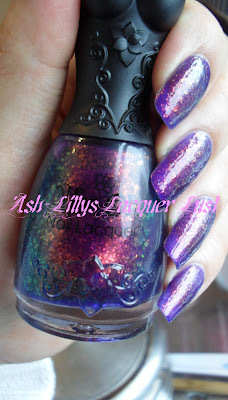 Ash-Lilly's Lacquer Lust: Happy New Year Readers!!! Hi everyone. Happy New Year!! Tonight I watched the New Years Eve fireworks (on the TV) which were being held at the Embankment, London. They had fireworks flying off the London Eye, all along the Thames and the display was spectacular...and I'm not one to be wowed by fireworks either. Me, my hubby, Sis-In-Law (SIL) and my hubby's best friend have also been sitting here reminiscing about past NYE escapades. Best friend has also just reminded me that House of Pain's 'Jump' is now 20 years old! Not that it was ever a favourite of mine, but I remember hearing it when I was out raving. I feel ancient now and I'm only 32 (going on 22). As it's now New Years Day I know a lot of people are probably reflecting and making a load of resolutions right now. Are you the type of person who makes resolutions? My only goals for this year are for me to try to stay healthy and stress free, enjoy my family and make the most of my potential. For me, this year was a good one; I had a healthy baby girl five months ago. From time to time my health takes a turn for the worst and I have to take medication that takes weeks to work (I'm still taking meds now that have made my face swell like a balloon :-() but my little girl is healthy and at the moment, so am I.
I'm enjoying my maternity leave right now and I intend not to let work get the better of me when I return. It IS hard though. We spend so long in the work place, it's hard not to take the stresses home with us. Good thing there are things like nail polish to make us feel better right? Oh look, whilst we are on the topic of polish, here are my Nfu-Oh's! These were delivered from Estonia a couple of months ago but I didn't get around to putting them up or even swatching two of them. 50, 113 and the super lovely 51. This was two coats. I think maybe four or five might give complete coverage. It looks great layered over a darker colour but I also like it like this. I'll get to the other two at some point this year, lol! Please don't be upset with me for not posting something current - I'm still rocking my last manicure and I'm loving it too much to get rid of it! Oh, I bet your little baby girl is cute! You will be find when yuu return to work. Keep praying girl it helps me get through the work days. The Nfu Oh's aren't the bottles amazing? Love them and 51 is just gorgeous! Tell me why it's still in my untrieds. Lol! Thanks RM - I'll take your advice! Those bottles are to die for right? I've only used the 51 once for this swatch...and after all the noise I made about it to! @Biba - I hope 2011 is treating you well so far! @Jo - Such a lovely comment, thank you! I'm always hunting in Superdrug. UK brand polishes don't get as much attention as they should so I'm proud to do my bit.